Will United Parcel Service stock fail to deliver in 2016? United Parcel Service (NYSE:UPS) is an undeniable leader in the logistics business. 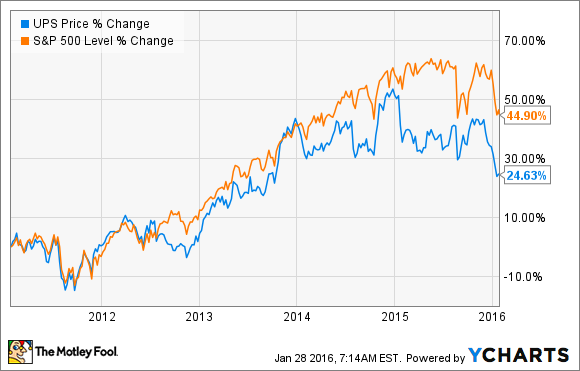 But for the past few years, its stock has sagged in comparison to the S&P 500. With another year ahead, investors need to know whether UPS stock is worth the risk. Here are three reasons United Parcel Service stock could fall. In April 2015, FedEx Corporation (NYSE:FDX) announced plans to buy Netherlands-based TNT Express for $4.9 billion. FedEx has always played second fiddle to UPS in terms of sales, but that may be about to change. With TNT Express' revenue tacked on to its own, FedEx's sales may be set to match UPS' this year. If the deal goes through, the newly enlarged FedEx will also kick United Parcel Service out of its No. 2 European business position, leaving only Germany-based DHL ahead in the European logistics leaderboard. It's uncertain whether the deal will go through. Earlier this month, FedEx extended the acceptance period to June 2016, and it's still waiting to hear back from Brazilian and Chinese regulators. But if all goes as planned, United Parcel Service will have a bigger competitor than ever before. Amazon.com (NASDAQ:AMZN) isn't a logistics company. But in Q3 2015 alone, it spent nearly $3 billion to deliver goods to customers -- equivalent to a whopping 11.7% of quarterly sales. That's a number Amazon.com wants to reduce, and it's attempting a variety of alternatives to make that happen. From an app-based platform called "Flex" that allows regular drivers to deliver Prime Now (two-hour delivery) packages in more than a dozen cities to special deals with USPS to keep shipping rates steady for Amazon.com sellers to potential shipping company acquisitions, the company understands it needs to diversify and cut costs. It's unclear how much United Parcel Service's business currently relies on Amazon.com sellers and Amazon.com, itself. A Wall Street Journal article notes that, in 2013, analysts estimated that UPS shipped around 30% (180 million) of Amazon's packages. And today, UPS offers Amazon.com sellers up to 37% off its standard rates. Regardless of today's amount, UPS has reason to be scared. Amazon.com's explorations represent a disruption to a sector it's dominated for decades. If Amazon.com goes vertical, or ramps up its "sharing economy" app-based delivery deals, UPS will be nothing more than an expensive middleman. There's little doubt in anyone's mind that the shipping logistics business will continue to grow. For corporations like United Parcel Service and FedEx, the real question is how they can make more money off steadily growing sales. Recently, UPS has gotten a bottom-line break due to cheap energy prices. That's kept customers headed to high-margin air shipments instead of switching to lower-margin ground transport. UPS' international sales also pull in more profit per piece. Currently, UPS has some of the best gross, operating EBITDA, and net profit margins in the industry. But as competitors like FedEx scale up, and players like Amazon.com enter the logistics business in full force, United Parcel Service investors will need to keep a close watch for shrinking margins. 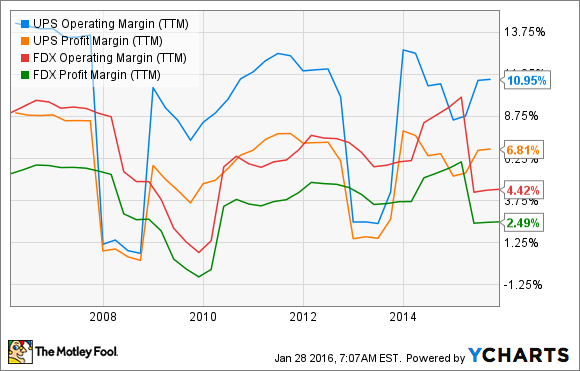 UPS Operating Margin (TTM) data by YCharts.